You KNOW I love a good sale!!! Well, here's a GREAT one! It's like an after Christmas sale that goes all month long! It actually doesn't end until January 3rd but some products are while supplies last only! Oh, and while we're on the subject of ending January 3rd... the Holiday Catalog ends then too! 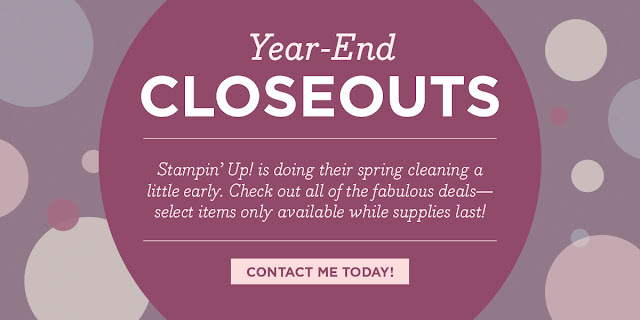 So be sure to add those retiring holiday products to your order this month! Use this month's hostess code AYFTDHCC and I will send you a free gift! As a THANK YOU I'll give you a little sneak peek of a BRAND NEW PRODUCT from Stampin' Up! right now! You can buy these in January, but if you want them NOW! talk to me about joining my team and getting all those new products before everyone else!